L 5 1/2″ (14 cm). Description: Sexes similar. Brownish-green above; yellow below; brownish tinge on breast; broad yellowish or whitish eye ring, usually broader behind eye; and lower mandible is entirely bright orange. Wing bars are less conspicuous than Yellow-bellied Flycatcher’s, and the tail is longer and the wings and back are slightly browner. Juveniles are browner above, have buffy wing bars, and whiter below. Habitat: Usually breeds in forested canyons and mountain slopes, but found during migration in deciduous trees along streams, in oak-lined gullies, and other wooded habitats. 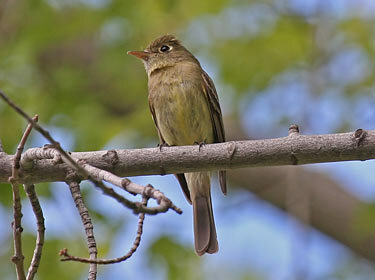 Where in Nebraska: Rare migrant and very rare or accidental summer resident. One definite nesting record from Sioux County, and observed in Scotts Bluff, Garden, and McPherson Counties. Fun Facts: A group of flycatchers has many collective nouns, including an “outfield”, “swatting”, “zapper”, and “zipper” of flycatchers.